To be FOCUSED as expert retailers, with a customer-centric approach on travellers, while creating synergies through integrated systems. To be GLOBAL, with respect to countries, locations and networks and to generate global value through our local know-how and local market management. To DELIVER solid financial performance for our shareholders through operational excellence, by leveraging our robust operating model on our capabilities to consistently innovate. To be SOLID in line with our Swiss heritage, which stands for stability, solvency, quality and the attention to detail. Our success relies on thousands of people around the world getting up everyday being happy to come to work with a smile, and being dedicated to giving our customers exceptional service. We know that if we become a great employer, we will become an even better business. We believe your talents will help us build a reputation for excellence. We want to be a great global employer and provide everything you need to be successful. 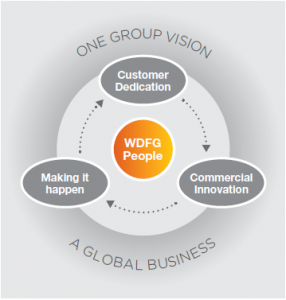 When you join the WDF team, you will be fully introduced to our ways of working through the company values and our People Promise.